Welcome to our website. This project documents the history of exhibitions in late nineteenth century London. 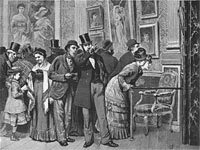 Its aim is to explore the everyday world of commercial art dealers, artist led exhibition societies and clubs by recording the vast spectrum of art displays on offer to the Victorian gallery visitor at any given moment in time. Please note that this site does not currently include records of exhibitions at the Royal Academy, the Royal Society of British Artists or the Grosvenor Gallery. These can be found through printed sources elsewhere (see Resources). Development of this site is in progress. If you don't find what you're looking for on this visit, please do return for future research updates. Learn more about The Project or search for exhibitions.